A quick little handy hint for you today. Do you ever struggle to get a wood mounted stamp set back into its case? I know I have had a few arm wrestles with those blocks - feeling a bit like I was doing a tricky jigsaw or a Tetris puzzle. Now if I open a new wood mounted stamp set and it looks quite full, I quickly grab my phone and snap a pic before unpacking and mounting the stamps. I make sure to get a little of the sticker so I can see which set it is. Then I can refer back to the pic if I'm having a bit of a spatial stamp packing challenge. If I'm feeling super organised I take another pic once I've mounted the stamps and put all the stickers on. This year I've chosen 'Priorities' and I wasn't sure at first that I'd picked a word that resonated with me but it is quite growing on me now that we're back to school and getting back into routines. I had lots of fun this evening having a play in MDS to make a little 6 x 4 inch sized project to print and pop on the fridge where I'll see it each day. I've used the digital Sweet Sorbet DSP. I've got the 'real paper' pack of this too and it is just gorgeous. I love the colours. Then I added alphabet punches of the letters for my word, filled them with the colours from the paper using the colour picker tool. I added some digital transparent tape underneath so they'd stand out a little more, plus some drop shadows and grey matting. Might be hard to see in this picture but I've also added some words faintly in grey on the letters to remind me of some of my priorities this year. The first one is 'words and actions.' I went along to the Junior School info night at the kids' school earlier this week and one of the presentations was from the school counsellor. Amongst other things she spoke about 'showing kids we care with our words and our actions' and that sentence has really stuck with me this week. What are your priorities for this year? The challenge for me is always keeping them front of mind when we start to get busy. I have a bit of an aversion to our calendar getting too hectic but it gets tricky to keep those white spaces some weeks doesn't it. Anyway - good luck if you're setting forth on renewed efforts towards some of your priorities this year. 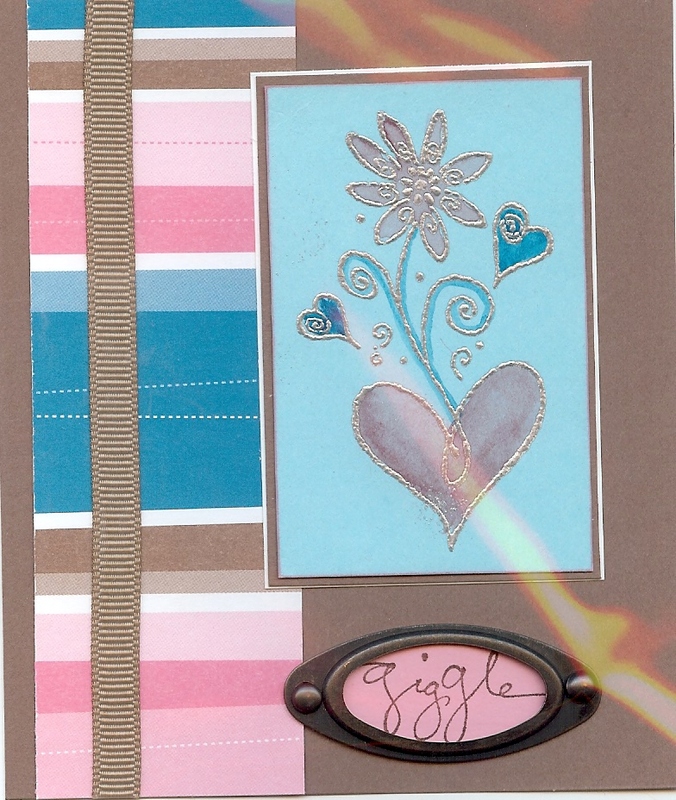 A scrapbooking bug always seems to hit me in January too along with a spring cleaning bug. I recently found an 8 1/2 x 11" album so have kicked off the year with a layout in those dimensions. Actually I think mine is a bit narrower at 8" wide so I could use an A4 sheet for my base - chopping a little off the top first. This one is a double page spread on facepainting. I used the Notes and Details stamp set from the Summer Mini for this one. The 'details' stamp is from that set plus some handy lines which I stamped in Versamark on Night Of Navy for my journaling. Base cardstock is Sahara Sand plus I've used Night of Navy and Tempting Turquoise. Some narrow white taffeta ribbon is about the only other addition. Nice and simple. I wanted to make the lavender Hannah pic the focal one so matted that in white. I'm in a bit of a waffling on mood and rather than do that here or bore the socks off John, I thought I'd make myself a new blog just to waffle on to myself mainly, plus any friends, family or fellow blogworld inhabitants that might want to stop by. I called it 'Just Me.' Perhaps I should have called it 'Just Waffling On.' Anyway if you'd like to have a look you can find it here: Just Me. I'll be back here though with plenty of cards and scrapbooking layouts and a few other crafty projects floating about in my head and keen to get out. Happy New Year everyone. Wishing you lots of laughter, fun and happiness in 2011. Wishing you lots of time too for the people you love, the pastimes you enjoy and the priorities you have for this next year. I picked up this bunch of flowers for just $3 at the supermarket and thought they looked bright and cheerful - just perfect for my kitchen bench. Just perfect for this time of year too. I LOVE love love this time of year. Time for slowing down, reflecting on where I am and thinking about what plans and goals and changes are needed in my life. How did you spend New Years Eve? We had a very nice quiet one here. Then we pulled up chairs to the big glass doors that look out on our balcony and across the valley to the city. (We would have gone out on the balcony but we're not getting along too well with the big mozzies!) From our place we can see the fireworks at the Docklands - our own personal fireworks show. 9.15pm for the kids and the midnight one for John and I. Quite a nice way to spend the evening this year I thought. And now I'm madly in the middle of my latest clean out, sort out, throw out, simplify life phase - often hits about this time of year. I'm hoping this one lasts quite a while so I can make it round lots of the bits of clutter that have built up this year in the busy patches. Decluttering the house and decluttering my mind at the same time. I'm sure these things multiply when we're not looking! Going for less is more this year and picking out a pencil case worth for Jack and for Hannah and popping the rest (of the ones that made it through the cull) into a container for when the first lot are wearing out. When I need a bit of a break from this decluttering phase, I'll be back with some cards to share! And some scrapbooking too - managed to fit a bit of that into the week as well. Whatever your plans are for 2011 I wish you all the best with them. "Mum, can Jack and I share a banana?" Hannah burst into the study to ask me this a few days ago. After I picked myself up off the floor - 'banana' is not usually the food item at the end of that frequently heard sentence! - I thought, "When I get time I'll scrapbook that." If you've ever found yourself saying 'When I get time .....' you might be interested in my article today over at Aussie Scrapbooking. You can find it here. Here are a couple of layouts from my article. Click on them and change the % in the lower right corner of the new screen if you want to read the journalling. Some 'bite sized' heritage album ideas there using Secret Garden Scrapbooking kit. Check out the kits on pages 137 - 139 if you'd like a kit to help you get some speedy scrapping done. I've just enrolled in Erika Martin's Soulology Online Scrapbooking Course and am really looking forward to it. Two of the talented scrapbookers from the Stampin' Up team I belong to are on the design team - Claire Daly and Anita Meade. I love their work. I've been looking at the course for a few weeks now and finally decided to register. It sounds like it will be very inspiring and thought provoking. I believe there are a few spots still remaining if it sounds like your cup of tea. Scrapbookers - Ever tried using your scanner and printer to make your own background paper?? Which reminds me - Anita had a quote on a blog post recently that really struck a cord with me. It is here if you'd like a gentle reminder to appreciate the things that matter most in our lives. Some days I get it, some days I need to read some words of wisdom to get my perspective back, ....... some days I need them stapled to my forehead! Well - its exciting to me anyway! I've mentioned the website Aussie Scrapbooking a few times lately you might have noticed as I've been enjoying reading the scrapbooking blog posts there and trying some of the challenges and competitions. I'm quite chuffed to let you know that I will be joining their crew of regular contributors so keep an eye out for my scrapbooking posts over there. www.aussiescrapbooking.com.au if you want to take a peek. Most of my scrapbooking tends to be about my two munchkins. I think I specialise in higgledy piggledy albums with a bit of this and a bit of that, rather than working on one project from start to finish. It suits me though. We love looking through the assortment of albums on the shelves and remembering snippets of daily life that we would otherwise have forgotten I am sure. That is the real magic of scrapbooking and why it is such a passion of mine. I'm looking forward to my new role at Aussie Scrapbooking. Pop by sometime and have a look around. When I had my major craft clean up last weekend I decided to add some more photos to my workspace. I like looking at some of my favourite shots of my favourite people while I work. Here is the current crop on my magnetic board. And in the shelf section above where I sit I have a space for some more pics plus a spot to put whatever cards and items I've made most recently, before they are ready to go into my display box, or into envelopes and sent on their way. Where do you do most of your paper crafting?? Sometimes I like to take a project and set up on the kitchen table or in front of the TV. I really appreciate how lucky I am to have a desk and shelves though in a room with a door that Jack (nearly 2) can't yet reach! Very handy, especially given his fondness lately for drawing with crayons. So far always on paper, but his version of what paper is good for some crayoning and mine sometimes differ! Back soon with some more creating. Thanks for popping by. My first flick through the Stampin' Up! Catalogue and Ideas Book that my friend Leanne brought over one day got the cogs in my brain spinning. Before I knew it my wish list had exceeded my Christmas stocking space! Another quick peruse through the catalogue and I was hooked. So much so that I could not get my brain to focus on actually making a card that day and had to pull it to bits and reassemble it later when I regained a bit of concentration! Anyway to cut the story I got the forms, spent the next few days engrossed in the catalogue, selected and reselected the stamp sets for my starter kit a dozen times before finally posting off my forms, and restrained myself from hugging the postman when he delivered my big box of supplies. Looking forward to learning more about stamping, scrapbooking and card making, meeting lots of other crafty people, and perhaps introducing people to a new hobby. Being creative, using different craft materials and experimenting with new techniqes gives me a buzz. The sight of racks of coloured cardstock gets the heart racing ...shelves of coordinating scrapbook accessories ... a new edition of my favourite scrapbooking magazine .... the house to myself for an hour to create! Actually I have to confess that if I have half an hour spare with kids asleep or amusing themselves (or watching Playschool!) and face a choice between mopping or doing 'just one more page in this scrapbook' or 'just a quick card' or even 'just a quick lap around my favourite online craft sites - then mopping generally loses. Which is why I usually need a bit of notice before visitors call in. OK sometimes about a week's notice! But in the last few years I've amassed a good collection of scrapbooks which celebrate many of the special, ordinary, day to day moments which are otherwise relegated to my unreliable memory, a growing stack of personal, made with love cards to send to near and dear, and a comfortable lived in sort of house (that has the added bonus of helping the kids develop good immune systems! - I hope that theory turns out to be based in science.) Plus I am a much happier wife and mum when I spend some time in my space to create on hobbies I love.